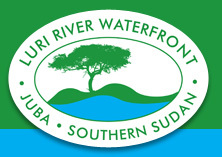 Luri River Waterfront is a privately owned company comprising of 5 shareholders. The investor group (with equal shares of 20%) is made up of Benjamin Bol, Rubix Energy, Frank Cawkwell, Tim Carson and David Raad. Experienced, professional and credible entrepreneurs, confident with regards to the future potential to S Sudan with over 80 years of business experience between them. A Sudanese entrepreneur, involved as a shareholder in the development of Buffalo Bank, Trans-African Logistics, TSSABM (Thai South Sudan Crusher, Aggregates & Building Materials), Home & Away business and entertainment centre as well Realdit representing a number of real estate developments. A New Zealand expatriate, with a background in mechanical engineering later moving into the farming private sector in Australia and then onto Transport and Logstics in Europe. This was followed by United Nations Emergency preparedness and deployment in South East and Central Asia, the Balkans, Caucauses and Africa. Since arriving in Sudan in October 2006, Frank has been involved in the set up of accommodation of water and sanitation, offices and other related infrastructure requirements for a multi-national fuel distribution company in 26 locations in Southern Sudan involving logistics in air, road and water transportation. Frank was GM of TSSABM from 2007 - 2009. He established VAMP supermarket in 2009 and is currently focussed on the development of Luri River Waterfront. A British Expatriate, who has been an active investor in S Sudan over the past six years. Tim is a Chartered Accountant with a Bachelor of Commerce (Honours) degree and a Graduate Diploma in Accounting from the University of Cape Town in South Africa. In addition to this, he has an MA in Law from Cambridge University in the United Kingdom. Tim has been resident in East Africa for the last 12 years. He developed Mocoh Petroleum South Sudan in 2004 and more recently Logali House Boutique Hotel in Juba. Tim also has investments in a Micro Finance company with activities in Kenya, Uganda, Rwanda and South Sudan. In addition to this he founded a small hotel in Johannesburg. Rubix Energy Co. Ltd is a downstream petroleum specialist involved in procurement, sale, and distribution of refined gasoline, diesel, Jet Aviation fuel, illuminating paraffin, Heavy fuel oil and LPG in Sudan. Focusing on strategic storage as well as creating & running effective fuel supply chains. This has led the outfit to join the Luri River Development Consortium where they see the potential to develop and drastically improve the refined product market in Southern Sudan. Rubix Energy Co. Ltd projects to have a foot print in the regional market namely Kenya, Uganda, Rwanda, and DRC. David Raad is a former United States diplomat with more than 8 years of Sudan-specific experience. During his experience as a diplomat, Mr. Raad helped found the US Department of State's Sudan Programs Group and his portfolio included economic, development, security and counter terrorism-related subjects. David was a core member of the United States' representation to the Sudanese peace talks which culminated in the signing of the Comprehensive Peace Agreement in 2005. Upon signing of the peace agreement, the late SPLM Chairman and South Sudan President Dr. John Garang asked the United States to second David to the SPLM and emerging Southern Sudan government as a political advisor. Following a successful 18 months of working as a political advisor for the SPLM, Southern Sudanese leadership asked David to to help investors interested in betting on Sudan's future better understand the challenges and opportunities. David kicked off his own venture creating David Raad & Associates. Since 2006 David has successfully assisted clients in a diverse spectrum of industries including manufacturing, financial services, mining, natural resources (Teak and biomass), construction, aggregate supply, logistics, security and others.